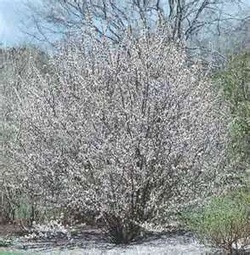 Western Sand Cherry displays attractive white flowers in spring which are followed by purplish black sweet berries. They can be eaten fresh, dried, or made into jams and pies. Western Sand Cherry likes to be planted in full sun. This shrub has silver-green foliage and turns to burgundy in the fall. It will grow to a height of 5' to 6' tall and 5' to 6' wide. It will tolerate poor soil. The berries are relished by many birds and wildlife. Western Sand Cherry provides a nesting cover for a game birds as well as songbirds. f you wish to harvest the berries yourself, protect the berries with bird netting as they ripen. This shrub can be used as a screen, hedge, border, or windbreak.